Writing a book on research methods in Social Gerontology is a more challenging task today than ever before. Anne Jamieson and Christina R. Victor, the editors of Researching Ageing and Later Life, stress that Social Gerontology has undergone significant changes in recent times. In theoretical terms the discipline has ceased to focus exclusively on 'the problems of old age' and has gradually adopted a more sophisticated approach to later life and to age and ageing more broadly. Moreover, the methodological repertoire has been extended to include both new data sources and novel techniques[mf1]. The contributions of sixteen authors, all prominent researchers in the field, illustrate this methodological heterogeneity in different ways. The book is divided into four parts. Part I compares new and old methodologies in the light of the changes of approach that have taken place in Social Gerontology. Part II introduces different ways that researchers make use of existing sources, e.g. cultural images (such as novels), documentary material (such as parish registers) and data from the Mass-Observation Archive. In a concise but extremely informative chapter, the opportunities and limitations associated with secondary data analysis are discussed. Part III deals with the creation of new data. Methods such as life history research, diary-based research and case study research in psychology are presented. Another chapter discusses approaches to evaluation and the increasing demand for 'evidence-based' practice. This part of the book also includes an instructive presentation of the basis of longitudinal research. The final section, Part IV, is comprised of a more general discussion of the role of the researcher, both in relation to those being researched and in relation to the different stakeholders. It takes up the ethical issues involved in researching later life, researching ageing across cultures and ethnicities, the many roles older people may take [mf2]in social research and, finally, a critical examination of the use of social gerontological research in policy making and practice. Researching Ageing and Later Life successfully tackles the complex task of presenting the methodological development that has taken place in the field of Social Gerontology. The overview of sources and techniques can, of course, not cover the entire field, but it is well chosen and gives a balanced and acceptably representative view of a pluralistic research area that includes a variety of disciplines and quantitative as well as qualitative methodologies. A particularly valuable aspect of the book is the consistent inclusion of illustrative case studies and examples. The book is not a technical handbook or a 'recipe book', but the emphasis on the practical application and usage of the methodologies makes it feel relevant and inspiring. However, an attempt to discuss the possibility of integrating/contrasting sources and techniques, in the light of the various methodologies presented, would have been an interesting addition. 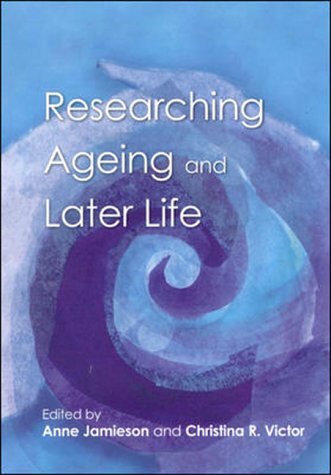 The anthology Researching Ageing and Later Life represents a successful and welcome attempt to illustrate the complex methodological development that has taken place in the field of Social Gerontology. The book can be seen as an important resource for both researchers and students of Social Gerontology. [mf1]This term can be ambiguous - does it refer to using novels or do you mean novel in the sense "new"? [mf2]I am not quite sure what you mean here - as researchers or as th eobjects of research?